If you are stressed because of study or work, how about enjoying some relaxing moments with am extremely short game entitle Minecraft Themed Shooting Gallery? If you see the word Minecraft in Minecraft Themed Shooting Gallery and you guess that you are going to mine or craft some things, it is not right in this case. Trying to shoot as rapidly as you can is the main target of the game. Shooting at the objects appearing on the screen like pigs is at level 1, creepers at level 2, and skeletons at level 3. At level 4, three options are offered including 5 seconds, 10 seconds, and 30 seconds. Within time of a selected option, you ought to shoot at objects as quickly as you can. To make Minecraft Themed Shooting Gallery more interesting, you can ask some of your friends to play the game, and then all of you compete against one another. 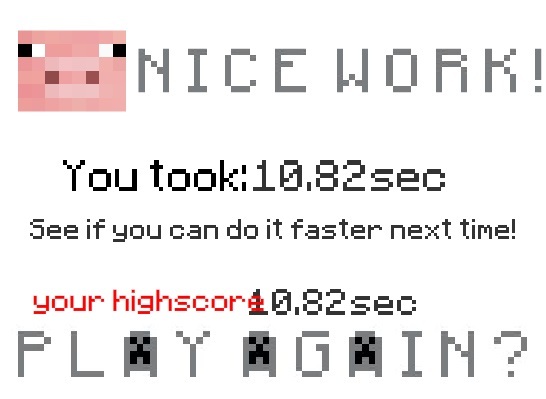 This game is not like other Minecraft games which takes long time to finish challenges. If you have been playing Minecraft games, why don’t you take some time to play Minecraft Themed Shooting Gallery for a change? Enjoy Minecraft Themed Shooting Gallery and share your comments with other players around the world below! The game uses the mouse to play.